Arrived relatively late today (Tuesday). After some dinner, met up with Gil Hova. Gil wanted to play Captains of Industry, and I'll never say no to that! We found two people looking for games and started it up. I was very nervous in setting up the game. The two people who joined us knew nothing at all about the game when they agreed to play. 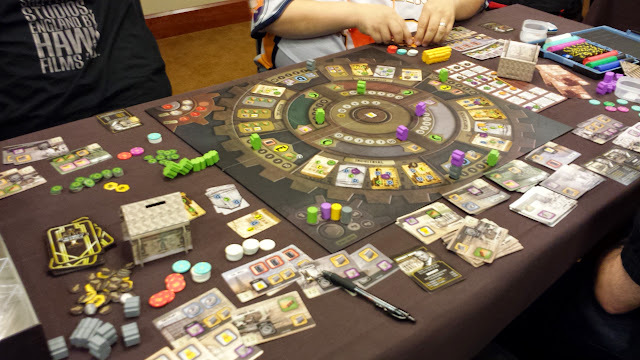 While I love Captains of Industry without reservation, I also recognize that 2.5 hour, dry, heavy, economic eurogames are not everyone's cup of tea. I definitely expect to find an audience here at BGGCon, but I was worried that a non-self-selected group of players would not be likely to enjoy this type of game. To my surprise, both players reported finding the game very enjoyable! One said some of the deeper strategic implications of certain things are not clear to a new player, but he felt that just meant he would have to play it again. I was very happy starting off the week on such a positive note. 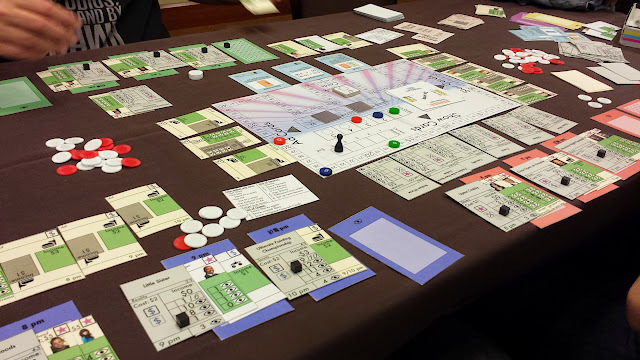 Afterwards, we playtested the latest version of Gil's Prime Time prototype. I was happy that Gil took my advice of stacking the deck of shows to have an increasing curve. The game was vastly improved for it. I stuck with my go-to strategy of doing nothing but collect resources during rounds 1 and 3 to set up for big point gains in rounds 2, 4, and 5. It worked again, but this time it was close and I only won by 1 point. You have just finished playing a game for the first time. It was long, complex, somewhat dry, and you didn't really understand most of what was going on. Because of that, you got your tuchus handed to you by the people who already knew the game. A non-gamer says "Screw that. I'm going to go (read a book/watch TV/play Monopoly)." A gamer says "Let's try that again, I haven't figured it out yet." Not that I expected anything less from BGG.Con, but congratulations on such a great start to your convention. Thank you. The awesomeness has continued. I haven't even had the energy to write up a summary each day. Will put together a wrapup on Tuesday.